Yeah I don't have an account there, you could pop on over and see if there's any interest. So what exactly would they fabricate? Brackets and brake lines? All they fabricate is a mounting kit, the rest is up to the consumer. I want to say that we really should focus on RS brake adaptation vs CTS-V (Granted I'll take what I can get haha). The 6 piston CTS-V sit on a 14" rotor (370z track pack rotors), but those calipers are $380 apiece vs $150ish for the 4 piston per caliper. RS brakes on the other hand use a 13.75" rotor and have a newer design monoblock caliper. The one thing I'm concerned about if we go above 13" rotor size is the wheel diameter due to the fact the RS brakes on an ST require RS equivalent wheels aka 19". Basically, if we want this to happen, sounds like for now we're limited to 4 piston cts-v setup, since we need it to work for the 17" wheel crowd if we are wanting to convice ctsvbrakeswap guys to take the mazdaspeed/FoST plunge. I would imagine the 6 piston and 4 piston would mount up to the same bracket? Also, from what I'm seeing the RS calipers are carrying a pretty hefty price. 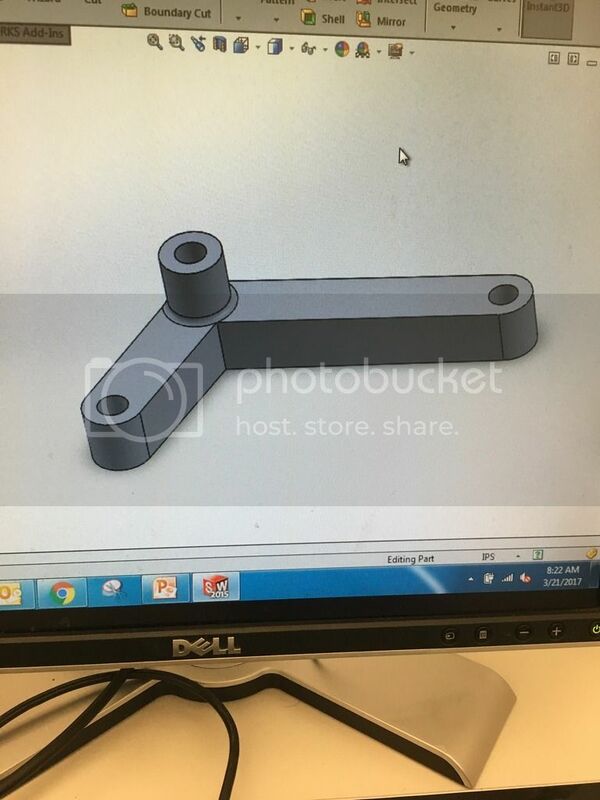 How I envisioned it is they fabricate the bracket/mounting hardware, and whoever buys decides whether they want the 4 or 6 piston. Then from there they can buy the rotors accordingly. That way if you're running stock wheels you can buy the 4 piston for your application, but the 6 piston is always available should you run a larger wheel. Correct me if I'm wrong though, I could very possibly be looking at it the wrong way. Last edited by MunkieJunkie; 02-02-2017 at 12:17 PM. A 14" rotor will sit inside an 18" rim. It clears the barrell, the issue would be are we able to run a rim with enough offset to keep the spokes off the caliper. We dont really need an increase in rotor size. It would be nice, but the stock brakes can be tracked with relatively little fuss from a heat capacity standpoint. Just whatever fixed caliper option we can get for better for wear is all this platform really needs. Gotcha, I see it now. 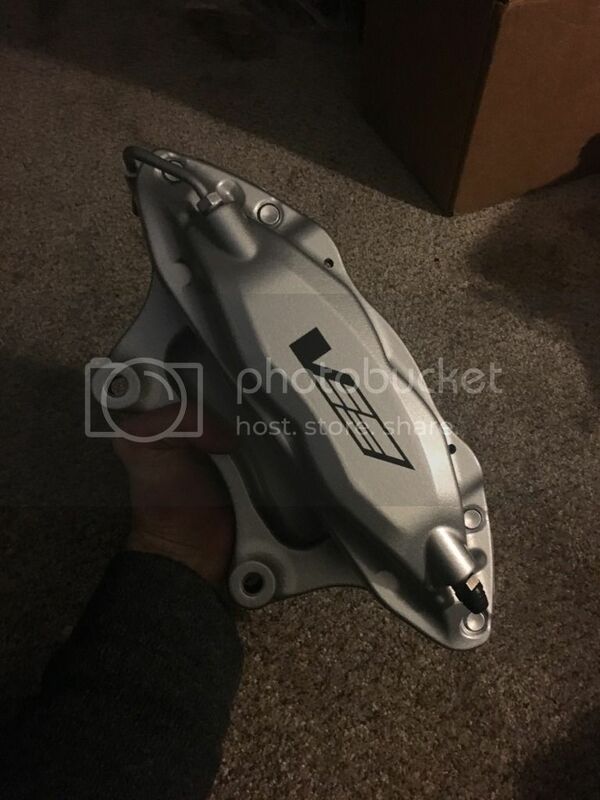 The 4 piston is definitely a solid looking caliper, and for 150 each is bonkers. https://mazdaspeeds.org/index.php?th...01/#post-33003 Linky to other thread. Here's what they replied to my email. "Do you have a link to a thread on the forum we could take a look at? Or start a thread to gain interest? If there is enough interest we could start looking into making a Mazda kit." I'll link them this thread, and I'm sure the more people that see this/the more interest we get the higher chance we have of getting a kit made. I'd totally be down with a bbk that's decently priced... GROUP BUY! I have a feeling I'd like the price point of these. To be honest if I can fit a 16" wheel for my winter set up I'd be happy and more than likely pursue these. I'm pretty sure the gen1 brembos would, which is the ones I'd be looking at. Plus those are cheaper. 100% Interested and would gladly buy a kit once it becomes available! I would buy this if it came out. I watched the caliper flex video on youtube and cringed hard. For drag that might be fine, but I've seen nothing but fail from the Wilwoods on the track. I can't remember who @maisonvi; maybe? ), but they were warping rotors at the track like nobody's business. I'm attaching a spreadsheet of calipers and rotor dimensions I researched when I was looking at this exact thing years ago. Might be helpful. No update, haven't heard back from them. 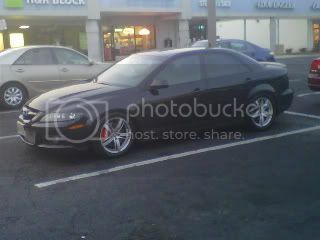 Interested for an ms6 only if they can fit 16" wheels. Edit: After some poking around on Centric's site and @Mattyhawk1;s spreadsheet, it looks like evo rotors are our best bet. Comparatively speaking the rotors are fairly similar to the sti rotors that are used in the subaru kits, the evo rotors are just 6mm smaller in diameter, 10mm shorter in height, and 2mm thicker. Now it's just a matter of making brackets. Last edited by Mazdazilla6; 03-17-2017 at 05:32 AM. I got tired of waiting for them to not do this. sarm1084 and ryguy 3 like this. So you're going to design one for us MS3 losers riiiight?? It's too far out right now to say yes but I'm not saying no. So in other words...two weeks? This is awesome!!!!! Definitely let us know how it goes, and if you offer to make and sell these. Didn't get a chance to test fit this past weekend due to rain. Should hopefully be test fitting thursday. EwMPS, macdiesel and sarm1084 like this. 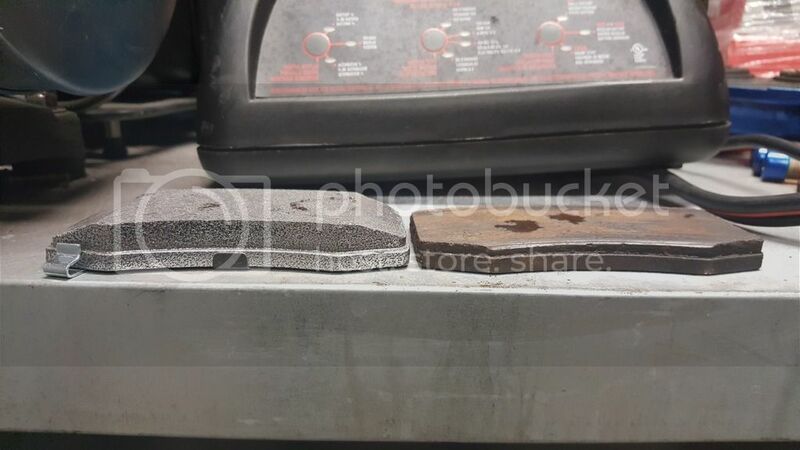 So i have finally found some alternative brake pads for the Brembo BBK for the MS6... 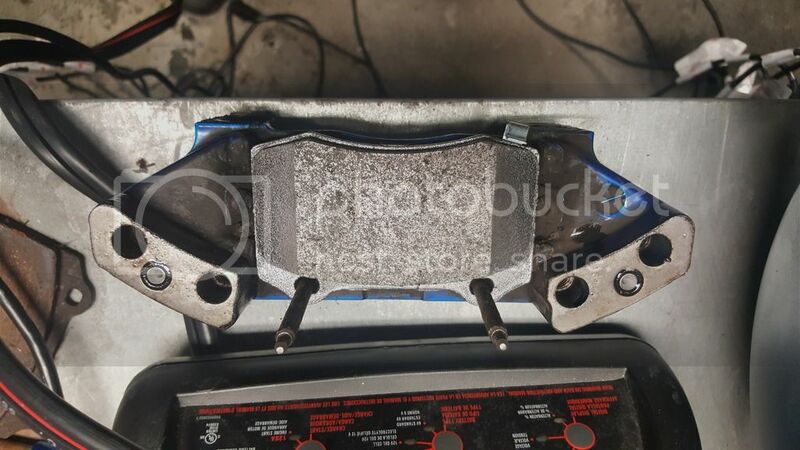 They are the rear brake pads for the 2005 CTS-v.. 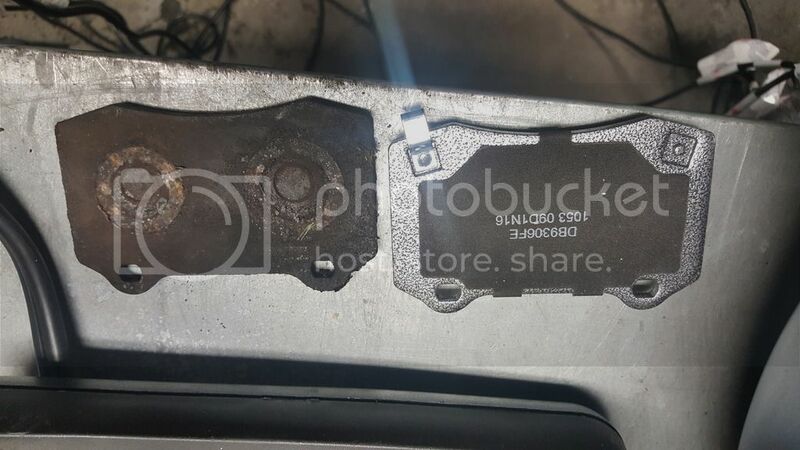 But i have a question for the brake gods out there..
Will this pads work for a replacement pad for the MS6 front pads? Will the slants on either end hurt performance? I only drag race so no auto crossing or rallying. What i am concerned about is that slants on both sides of the pads if it makes any difference..
No it won't affect anything. Pad coverage only affects pad life and wear characteristics. Your braking force is determined by hydraulic pressure in the system (force), your piston size(s) (area), your rotor diameter (lever arm), and pad compound (friction coefficient). Nothing to worry about. FYI that's a common pad shape, used by lots of cars so you have a lot of compound options. Test fit #1 was a failure. 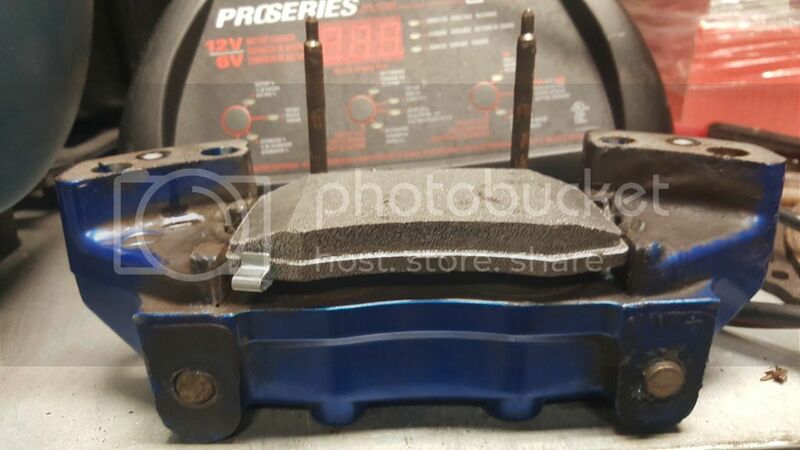 The evo rotor won't work with this caliper. Going to look at other rotor options. From there I can work on bracket dimensions. The bracket is probably going to be a tad more complex than I originally thought. It's a bit on the thin side. Also, for my purposes I'm not trying to make diameter larger. But thanks for the suggestion. I'm thinking the 2005 sti rotor might possibly work.